Bacteriophages (phages) drive the evolution of bacteria by antagonistic coevolution and by promoting transfer of genetic material between bacteria. Phages are intimately involved in a range of biological processes from carbon cycling to the maintenance of human health. Despite their global importance the coevolution between natural phage communities and their bacterial hosts remains poorly understood. This project seeks to understand the mechanism behind a novel Phage-Induced High-Cell-Density (PIHCD) phenotype using a droplet-based microfluidic device termed the Evolution Machine (Project funded by a Marie Curie Individual Fellowship). Figure 1: The Phage-Induced High-Cell-Density phenotype (PIHCD). A phage cocktail was prepared from a local Parisian compost heap and combined with a Pseudomonas fluorescens host containing a constitutively expressed GFP protein (proxy for growth). Compared to untreated P. fluorescens the mean carrying capacity was significantly higher in the phage cocktail treatment. Figure 2 – Overview of experimental design. 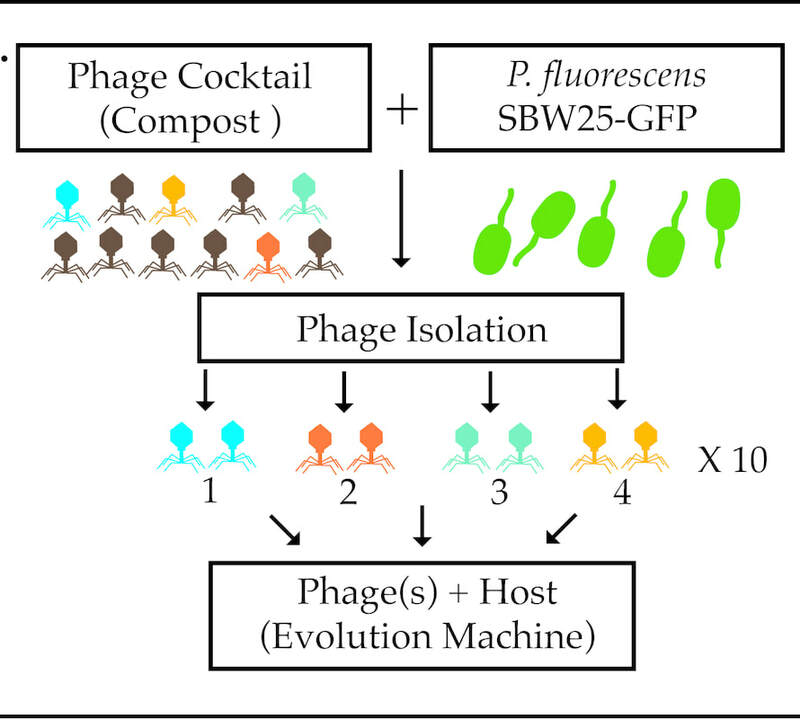 A phage cocktail will be prepared from the same Parisian compost heap as described in Figure 1 and standard plaque assays will be performed to isolate individual phage and determine the phage(s) responsible for the PIHCD phenotype. The underlying mechanism of the PIHCD phenotype will be determined using genetic manipulation and the long term coevolution of phage-host will be investigated using the Evolution Machine (see below). Figure 3- The Evolution Machine (MillidropTM Instruments). The Evolution Machine utilizes a 96-microwell plate to create a 960 droplet train that is pushed between two coils using air pressure. (1) The 960 droplet train is generated by dripping FC-40 fluorinated oil from the end of a tube while sipping from a 96-microwell plate resulting in a 100 nl droplet encased in oil and separated from neighboring droplets by air. (2) Once generated the train is pushed back and forth between two temperature-controlled coils using air pressure resulting in constant mixing of droplets. Approximately every 30 minutes each droplet is analyzed using a fluorescent detector and camera providing the ability to track growth (maximum cell density in each droplet ~105 cells). 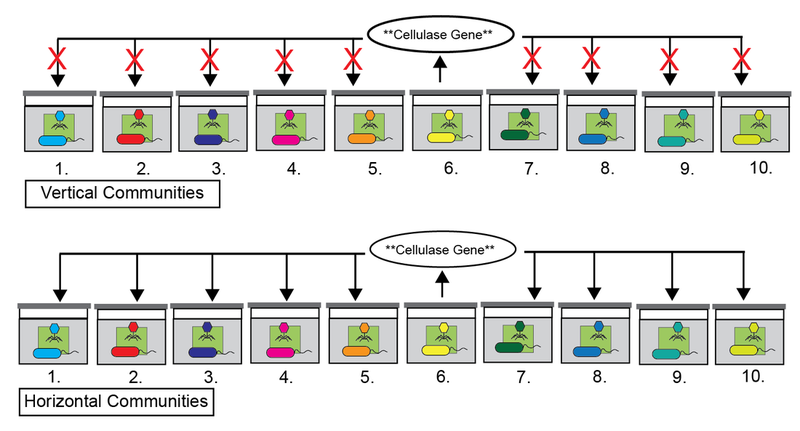 Following droplet incubation individual droplets can be (3) selected, (4) diluted into a fresh media in a 96-micowell plate and (5) a new train can be generated thus providing a high-throughput approach to evolve, select, and propagate microbial communities over time. Horizontal Gene Transfer (HGT) drives the evolution of microbial communities through the dissemination and amplification of adaptive traits. To date most studies have investigated HGT using a comparative genomic approach of individual isolates against previously sequenced genomes to construct phylogenetic networks of HGT events. While these studies have provided invaluable insight into our understanding of the ecology and evolution of HGT, direct experimentation investigating the process and functional impact of HGT on microbial communities is lacking. Here we designed an experimental regime to explore how HGT affects the evolution of cellulose-degrading microbial communities over the course of one year. First, ten founding communities were established by incubating compost with minimal media and providing cellulose paper as the sole carbon source. Next, the founding communities were split into two transfer regimes: vertical and horizontal. In the vertical regime each of the ten communities were homogenized every two weeks and transferred to fresh medium with a new piece of cellulose paper. In the horizontal regime each transfer involved the founding microbial community as well as a mixed cocktail of “phage juice” from all ten bottles, thus providing the opportunity for genes to move between horizontal but not vertical communities. Using comparative metagenomics, we provide evidence for large-scale movement of genetic material between horizontal bottles that involves genes with various predicted functions including iron acquisition, virulence factors, transcription, and individual phage genomes. As a general proxy for community function we also measured the ammonia concentrations during the course of the two-week regime. Surprisingly, we found that the majority of horizontal communities had significantly higher ammonia production compared to their vertical counterparts. To our knowledge these data describe for the first time the emergence of a functional impact of HGT on a complex microbial community through direct experimentation. Figure 1: The “Vertical” transfer regime. Figure 2: The “Horizontal” transfer regime. Figure 3: Experimental design provides the opportunity to observe HGT events.